This chapter provides a case study of a social networking site, Cloudworks, which has been developed to provide a space for practitioners to share and discuss learning and teaching ideas. It describes the perceived need for the site, the vision underpinning its development, its functionality and an overview of some of the patterns of user behaviour we are seeing emerging in the site. It applies the community indicator framework (CIF) described in Chap. 14 to explain these patterns of behaviour. Conole, G., & Culver, J. (2009). Cloudworks: Social networking for learning design. Australasian Journal of Educational Technology 25(5), 763–782. 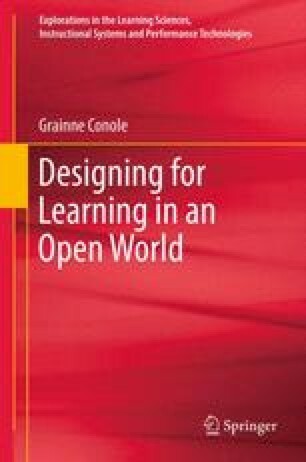 http://www.ascilite.org.au/ajet/ajet25/conole.html. Accessed 7 Oct 2011. Engeström, J. (2005). Why some social network services work and others don’t — Or: The case for object-centered sociality %U http://www.zengestrom.com/blog/2005/04/why_some_social.html. Accessed 7 Oct 2011. Engeström, J. (2007). Microblogging – Tiny social objects on the future of participatory media, cited in K. Anderson, blog entry June, 2007. http://strange.corante.com/archives/2007/06/13/nmkforum07_jyri_of_jaiku.php. Accessed 7 Oct 2011. Howe, J. (2006). The rise of crowdsourcing. Wired Magazine Issue 14.06. Available online at http://www.wired.com/wired/archive/14.06/crowds_pr.html. Accessed 7 Oct 2011. Weller, M. (2010, June 25). Open conferences and the legitimacy deficit, blog posting. http://nogoodreason.typepad.co.uk/no_good_reason/2010/06/index.html. Accessed 7 Oct 2011.